Thank you for your last picture on which I can see the fence, the paved path and the memorial stone. Thus, your location is the right location! Thank you very much for your intersting explanations. I'm now convinced that the location, which you provided is more likely the location of this Mausoleum than the one which I marked. Respekt! I'll add more. In Kazakhstan in 2017 a program was adopted to restore the shrinking and historical places. At the moment, work is in progress on the well-being of these places, so that the inhabitants of the country remember and honor their ancestors. Modern maps do not keep up with the changes. This is not a modern grave. In it is buried the elder-healer, who was a nomad. In Kazakhstan, very large areas occupy the steppe. Distances between settlements usually reach several tens of kilometers. Therefore, the nearest settlement is used as a guide. In this case, lakes can not be a landmark because they dry out in snowless winters. In our case, the nearest settlement is Uzynsu. According to the stories of local residents to the tomb of St. Taimas is 16 kilometers. If you need more evidence, I can provide you. Your location is about 20 km north of the center of Uzynsu (Узынсу). Does it still belong to the village Uzynsu (Узынсу)? The new view which you provided for your location doesn't convince me. But I confess, the view to my location is even worse. Thus I checked both on another map. On Bing map the object at your location looks very much alike the mausoleum. However, I cannot see the fence nor the memorial stone nor the paved path. At least, I can see the power line. But at my location you can hardly discover a mausoleum. Thus, you may be right. Now you provided a location north of the village. There I can see an object, that as well could be the Mausoleum Taimas Aulie. However, I cannot see the fence nor the memorial stone nor the paved path. At least, I can see the power line. Maybe the mausoleum is at the location that you found north of the village, maybe it's at the location that I marked at the village. However it's in the village Uzynsu (Узынсу) or nearby. The links that I found, provide the information, that the Mausoleum Taimas Aulie is located in Kazakhstan - Pavlodar (Павлодар) Province - Irtyshsk (Иртышск) - Uzynsu (Узынсу) which was called Suvorovo till 2006. 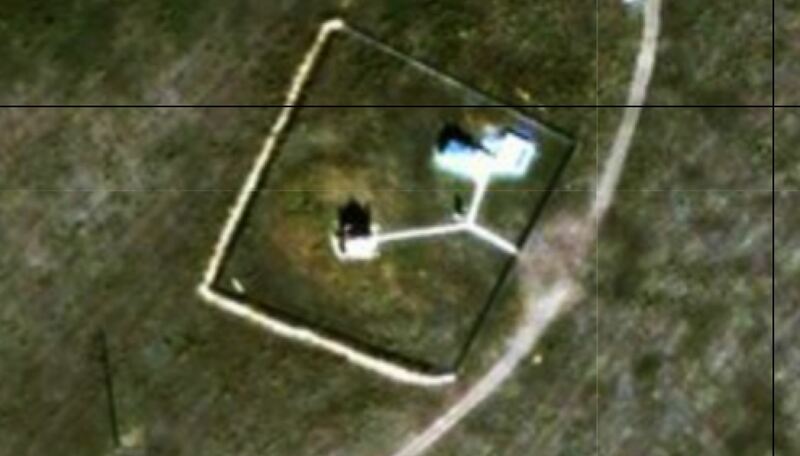 The resolution of the satelite pictures is too low to tell for sure where there is the mausoleum. However, I thought I found it at the marked location because of the structure and the open field with the power line behind. The mausoleum was erected on the territory of the Irtysh district of the Pavalodar region, Kazakhstan.